Welcome to my Burlington, Oakville, Hamilton and area homes for sale page. On this page you will find photos of my currently active Homes, townhomes and condominiums for sale as well as links to my Keller Williams Burlington office's 103 currently active listings. Additionally you might want to check out the list of upcoming open houses in Burlington Ontario. Please take note of the pre-defined property search links (see left panel) intended to help you quickly browse through all my brokerage office's Homes, Townhomes, and Condos for sale. 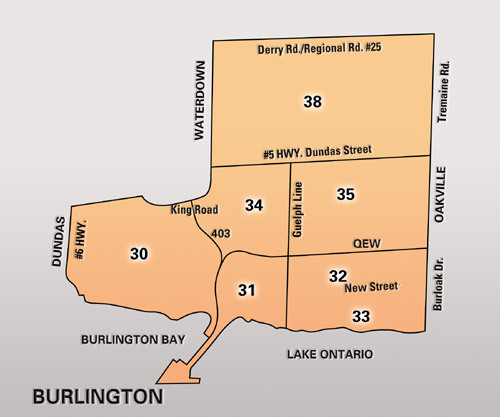 If you are interested in a particular area of Burlington, be sure to use the clickable map of Burlington shown below our featured listings; It provides access to all available Keller Williams Burlington listings for your selected area. Click on any area of the Burlington map to view homes, townhomes and condominiums for sale in the selected Burlington listing area.